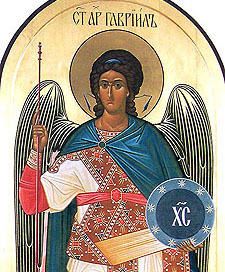 The holy Archangel Gabriel remained with the Holy Virgin Mary when She was a child in the Temple of Jerusalem, and watched over Her throughout Her earthly life. He appeared to the Priest Zachariah, foretelling the birth of the Forerunner of the Lord, St John the Baptist. The Lord sent him to St Joseph the Betrothed in a dream, to reveal to him the mystery of the Incarnation of the Son of God from the All-Pure Virgin Mary, and warned him of the wicked intentions of Herod, ordering him to flee into Egypt with the divine Infant and His Mother.